It's Walky! » Do you remember her screams? OH HEY, are you ready for an entire week of Sunday-style strips, from Sunday through the following Sunday? Also: The black backgrounds are back. I tried it with the white here, and nooooooooooooope nope nope nope, doesn’t work. Oh boy, I bet this will be a fun time for everyone involved and will definitely not end in tragedy! I just like it how HA visor changed, so it can show how he feels at the moment. Yup, HA’s visor is talented like that, it squints. you gotta love HA in this part, how he goes from incompetent invader from a comic strip to “oh hey, remember that time I tortured a child so I could use her screams to torture another child!” just like that. AND SAVED THEM FOR THIS PURPOSE. It’s the impressive dedication to being sadistically evil that keeps him memorable. Can we see the white backgrounds here? For some reason I want to see just what made you NOPE so much. Shouldn’t be too hard to white out, really. (Just did a quick mockup myself in MS Paint.) It’s not so much that it’s bad as the fact that those thick black borders are where the panels would otherwise be floating in space, and the darker color adds a lot of atmosphere. The previous Sunday strips work well enough with just negative space, but this one NEEDS the black. Probably a lot like this, though the panel structure here’s not as dynamic. Yay for the black backgrounds! Definitely more of the fan of the original black backgrounds. Yeah, did a mockup of this and then the previous two Sunday strips, and while the other two work either way the black background REALLY adds the atmosphere and oomph to this scene. I do not think I could ever get over the Duct Tape Table. Oh man I love how you can just see the pure hate radiating from, the Head Alien’s”Expression” here. I’ve always admired how the character can go from being so silly to suddenly reminding us what a wonderfully hateful and awful creature he is deep down. Head Alien loves his psychological kryptonite. Daily reminder that HA is actually pretty freaking evil. Black backgrounds are so much better. It took longer than it ought’ve to notice this one reads top to bottom BEFORE left to right. It also occurs to me that, in a way, HA exercises control over Joyce this way in DoA too. Just with entertaining cartoons instead of psychological torture. …maybe I’m reading too far into this, but after the Hymnal storyline I’m not ruling any parallel out. I’ve been kind of wondering if one of the behind-the-scenes motivations for the whole Brown family arc going on currently is the Dumbiverse funhouse mirror reflection of the “Joyce’s parents think she’s a lesbian because of something they saw on TV” bit from down the road here. I’d forgotten that bit. I’ve forgotten too much of the comic. Am I missing something, or does HA not realize that Sal and Walky are “actually” related? Cause if she can get through the embassy doors, then he should be able to as well. He was the one to spill the beans about Your Twin Sister Sal; he knows. But he had planned on Sal rushing in and reaching her first, then bribing her with the promise of resurrecting her (adoptive) parents if she opened the way for him. Never mind that he was the one who killed them in the first place; she blames herself for their deaths, and that guilt hanging over her head might’ve gotten Head Alieninto the embassy. 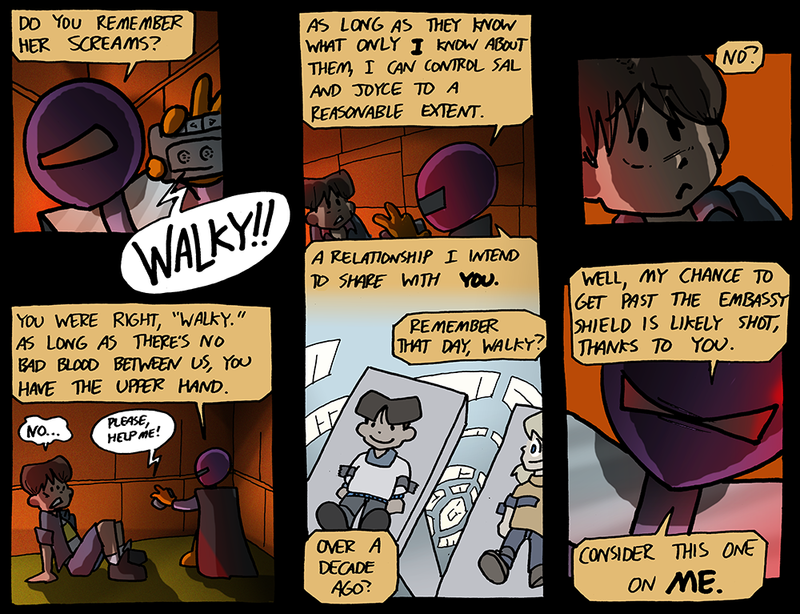 Walky doesn’t know about any of that stuff, so the tools HA prepared for manipulating Sal won’t be of any use. I’m willing to wager that his plan hinged entirely on Sal getting to him ahead of anyone else from SEMME, since presumably her squadmates would be the voices (and/or physical restraints) of reason. Wouldn’t 22 year old Joyce and 11 year olds Joyce sound a bit different to Wally?